The history of European expansion in Asia & Africa, decay of the Portuguese sea-borne empire of India. Freedom struggle of Goa, registers of Baptism, Births & Deaths, Deeds & Wills. Governmental Records, Speeches & Documents from the State of Maharasthra. 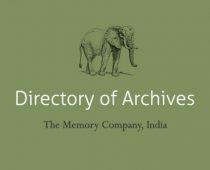 The primary function of the Tamil Nadu Archives is to centralise and hold all permanent records.